At last. After more than a half century, there is now available a book that thoroughly discredits all the movie industry protestations that there were no Communists in filmmaking during and after World War II, when in fact there were hundreds. Here is irrefutable evidence that they were very adept at using the screen to pound pro-Soviet propaganda into the heads of unsuspecting Americans in theaters coast-to-coast. 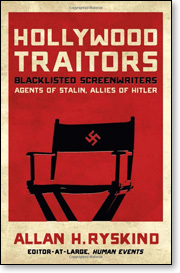 The more than 500 pages of "Hollywood Traitors: Blacklisted Screenwriters – Agents of Stalin, Allies of Hitler" expose in detail and with infinite documentation the pro-Soviet propaganda machine, including during the 22 months when Stalin and Hitler were allies. This long-overdue book is authored by Allan H. Ryskind, who grew up in Hollywood, and whose father was Morrie Ryskind, lyricist, writer of stage and screen productions, including scripts for the comedic Marx Brothers. The elder Ryskind, a staunch anti-communist, was a cooperative "friendly" witness before the House Committee on Un-American Activities (HUAC), which held years of hearings probing communism in Hollywood. For decades, Hollywood has struck back by using its control of large segments of the motion picture and TV industries to smear the reputations of those who exposed them. Today, the younger Mr. Ryskind, author of the new volume (and now editor-at-large for the 70-year-old Washington weekly Human Events), has given us specifics as to how the talents of screenwriters and others in Hollywood were deployed in the service of America's enemies. That subversion even showed up in the late 1990s in the beloved family-oriented TV series "Touched by an Angel." Suddenly, totally out of character, the defense of the Hollywood Communists was portrayed as a cause to be advanced with help from the "angel," the sweet Irish-accented actress Roma Downey. Little did we expect even Hollywood would hijack a far-above-average, highly-rated program as a hobby horse for one-sided political propaganda, specifically in defense of "Hollywood Traitors" – even in 1997, just as Hollywood was marking the 50th anniversary of congressional hearings that in 1947 (and later) had probed communism in America's film capital. As Mr. Ryskind writes, "Communist Dalton Trumbo, a prominent screen writer, 'Hollywood Ten' figure, and an icon, led the fight in America to ease Hitler's burden of conquest. He did this by demonizing Hitler's enemies." 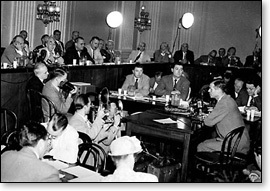 In its uproarious 1947 hearings, the House committee had nailed airtight evidence (including copies of Communist Party membership cards) that ultimately led to prison sentences for 10 of Hollywood's most prominent Communists for refusal to cooperate with a lawfully constituted inquiry of the United States Congress. Outright lies (pushed for many decades) of the "poor innocents," all the pro-Red propaganda movies, rivers of ink in communist-written books (see Lillian Hellman's "Scoundrel Time," for example), and lectures in academia collectively dissolve into intellectual dust as Allan Ryskind picks apart, fact by devastating fact, the disingenuous blather of "innocents" persecuted for their "political beliefs." Myth: HUAC uncovered very few Communists in Hollywood. Fact: So somewhere between 200 and 300 qualifies as "very few?" Don't think so. Myth: Even If there were a few Hollywood Communists, they were not influential. Fact: Then why were John Wayne, Morrie Ryskind, Walt Disney, and Ayn Rand concerned that "it looked as if Communists were in control of the industry?" Communists were ensconced in key positions of motion picture unions and studios. Myth: Hollywood writers were not subversive because during World War II, they turned out patriotic documentaries. Fact: Virtually every writer appearing before HUAC hid behind the First or Fifth Amendment when asked about Communist affiliations and activity. Myth: Writers did not favor force or violence in changing the United States into a Soviet America. Fact: Some did by refusal to deny or declined to say whether they would support the United States if the Soviets launched an unprovoked attack. Myth: The "innocents" were harassed by "Sen. Joe McCarthy's House Un-American Activities Committee." Fact No. 1: Joe McCarthy never investigated Hollywood. Fact No. 2: McCarthy, as a senator, never was permitted to be a member (let alone chairman) of a House Committee. Anyone claiming otherwise either is trying to cement a "big lie," or needs a refresher course in grade-school civics. If there is any respect for truth and honesty about Hollywood history, Mr. Ryskind's book will be the ultimate "go to" encyclopedic reference work.